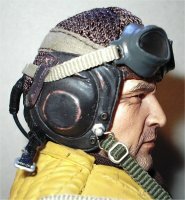 Welcome To My Luftwaffe HE111 Pilot Page. 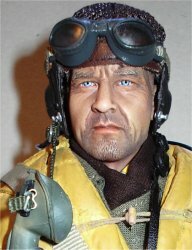 This page is about how I have made my Luftwaffe HE11 pilot which was to be based on the Dragon Hans Pifer figure. It is a nice model and the first boxed figure from Dragon I have bought in a long time. 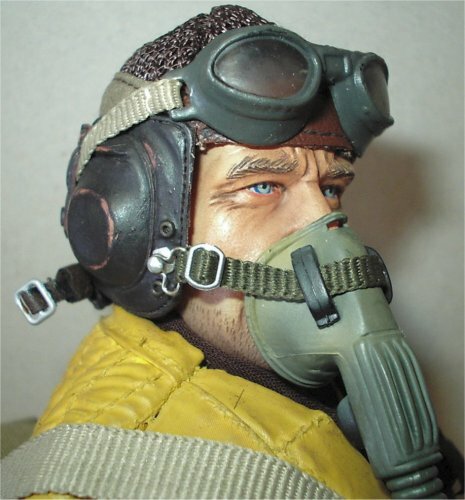 Although to complete it I have had to also buy some extra parts for it, such as the Newline pilot's boots, flare gun and belt plus the flying helmet and the oxygen mask. An interesting fact I have discovered regarding the Luftwaffe crews was, that they were not 'rotated' out of flying duties like the allied pilots during the war. In fact the only time they came off these duties was when they were captured, injured or even killed. So this helps to explain why they amassed such high 'kill' scores. I have not been able to use the head that came with the Dragon figure, because I ended up ruining it when I was doing the pastel wash. 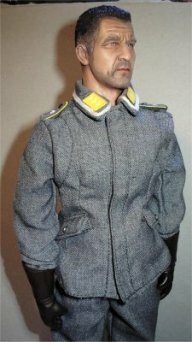 So as a replacement I have used a DiD William Bowman figure instead, and these pictures show the head after I have given it a pastel wash. Note: I do find that the pastel technique I use does work better on the DiD heads rather than the Dragon one's, as I have only ruined I think 12 Dragon heads so far since I have started doing it. So if I make it look easy about how I get the heads like this, you should see the 'casualty department' in my cupboard. 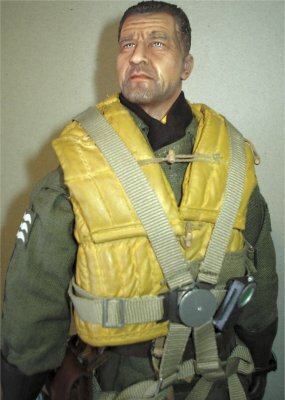 The uniform consists from the box of a tunic, trousers and the flight suit. 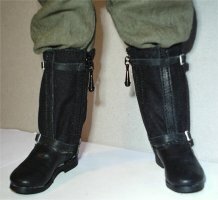 These are shown in the pictures below and one thing that I have replaced is the plastic boots, and I have used a pair of the Newline German pilots boots instead. It was during the assembly of the uniform that I found out I had another problem, and this time it was with the gloved hands. Because I had used the DiD head and body as a replacement, the peg on the Dragon hands would not fit into the DiD arm. So the only alternative had was to cut each of the gloves as shown right about halfway round, so that this then exposed the pin which I removed and then replaced the peg with a DiD one instead. 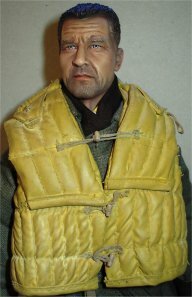 Once I had done this I then put some super glue on the open seam, folded the glove back in place and once dry I fitted the gloves to the figure. 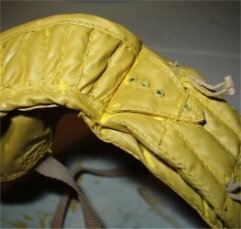 Note: Make sure when you cut the glove, that it is just under the moulded seam, as that way when it is re-assembled the cut does not show. Plus, make sure that the glue does not get onto the folding part of the inner hand joint, also to remove the pin on the wrist peg see this page. 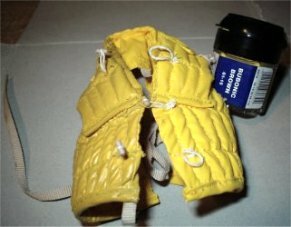 The picture on the right shows how I have tucked the flight suit sleeve into the top of the glove, to make this easier I have cut off the black 'popper's' to give me more space. 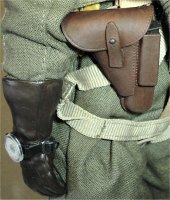 As this I feel these are not necessary once the sleeve is pushed into the glove. 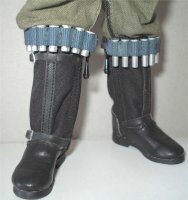 With this figure I was not happy with it just being as it came from the box, and the first things that were replaced were the boots as I not a fan of the plastic boots, so I obtained a pair of the excellent Newline boots. 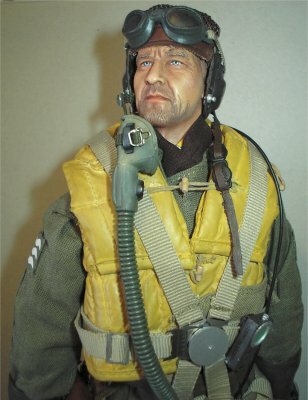 Also, the figure just had to have a flying helmet and the oxygen mask, plus a flare gun and flares. 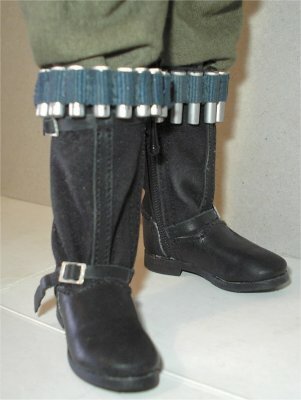 With the flare gun belt I wanted two belts around the boot tops, instead of just the one around the waist. 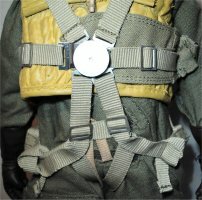 So I cut the flare holders off the belt, then I sewed some spare webbing strap onto the back also adding two spare buckles I had. The straps were then painted with some Blue acrylic paint to match the holders, and dusted with some grout to match them all in. 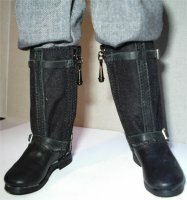 These were then fastened around the tops of the boots as shown on the right. 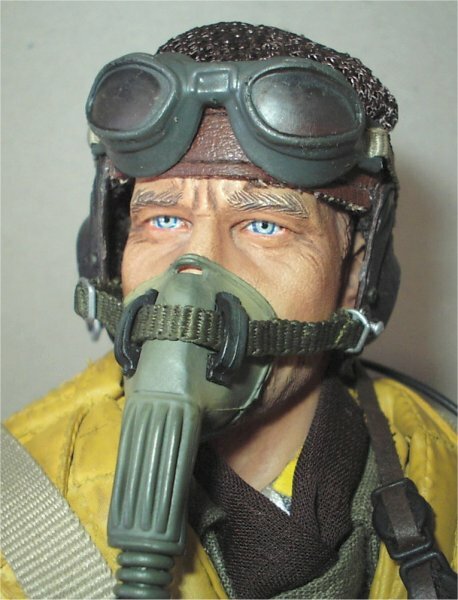 Other items I have used with this figure are the bbi Luftwaffe flight helmet from the Otto Schultz figure, which also came with the flight mask, connection cable and the throat microphone. 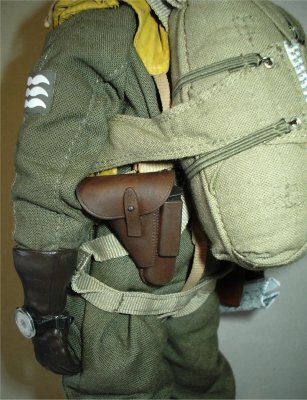 Plus I am also using the belt and pistol from the Dragon Eugen Kroh pilot figure, and the map pouch from the DiD Tim Becker figure. 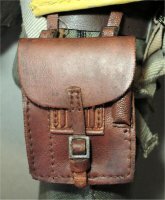 The pistol belt, pistol holster and the map case were repainted with the Daler-Rowney Burnt Umber acrylic paint. The results of doing this are shown below right, the pistol holster was also given a drybrush of the same paint after I mixed some White with it. With the map case because it is made from a type of vinyl, it has given me a nice aged look it once the paint has dried. Note: To get the helmet to fit correctly on the head, I very carefully removed from the inside the plastic pads that go over the ears. As they were making the helmet stand out too far from the head. With this it really started to annoy me with the bright yellow colour as it came from the box, as I expect that in reality they were never that bright even when brand new. Plus I also wanted it to look like it has seen some service. So I decided to do something about it, and I ended up repainting the whole thing with a darker yellow paint from the Games Workshop Citadel range called 'Bubonic Brown', numbered 61-15. 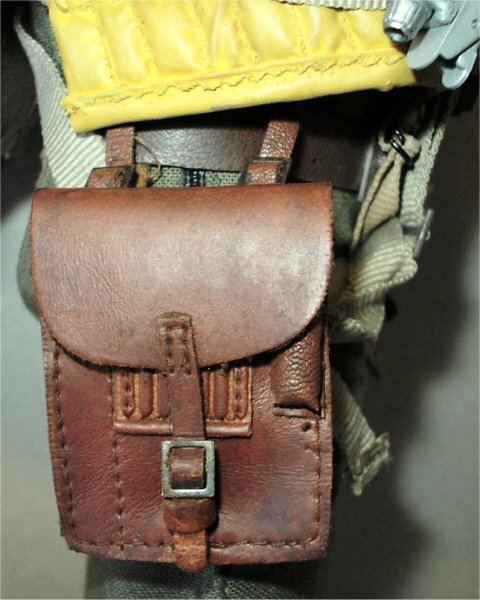 The immediate differences in the colour can be seen in the pictures above, in that the vest in the first two pictures above has the paint on the left side and the right is untouched. 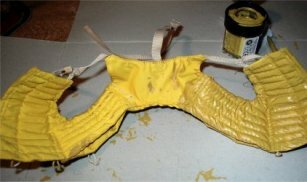 I used this particular colour as it was the only matt yellow I have at the moment. The third picture above right is where I have started to repaint the inside of the vest. I must say that once I got the front part done, I got to the stage of wondering why had I done this? Because once I had finished it and left it to dry for about 30 minutes, I then discovered that due to the creases in it, I had missed quite a bit of the inner folds and the edges. As shown in the picture on the right, so I loosened off all the straps and both twisted and folded the vest to show up where I had missed with the paint. Note: This took longer to do than the original paint work, as I had to let it dry and then check it again about three times in all to see if there were still any missed parts. 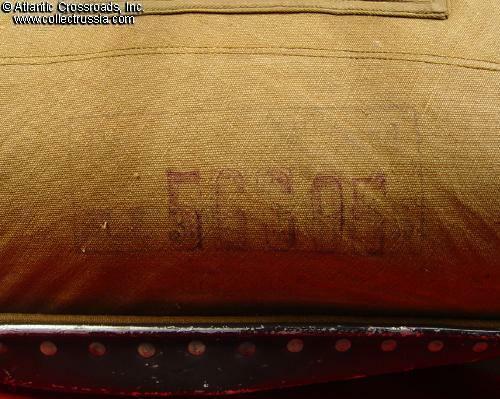 The straps and front fastening tags were then repainted with some Model Color paint USA Tan-Earth numbered 70874, as I did not want to leave these in the plain colour that they were. The final part done was I rubbed a knife blade over the metal eyelets, to get the silver colour back again. In the picture on the right, the vest has been given a dust over of some grout powder to lose the plastic look that the vest developed after I had repainted it. This did help a little, but after having an idea put forward by Dubar, I used some Yellow pastel chalks to give it another light dusting. This has helped a lot with losing the plastic look, plus it has helped to bring out some of the tops of 'ribs' as a highlight. 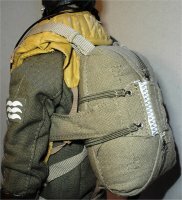 With this parachute I was hoping that I would be able to use it as it is, without having to alter the parachute lock as I have done on my Parachute Repair.pdf. 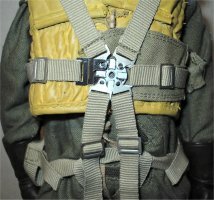 But I am afraid that after numerous attempts to try to get the straps fastened onto the little pips, with this figure I have had to again resort to the alterations to the parachute lock. 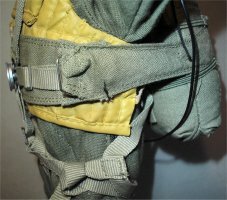 Important Note: I have also realised, that the wording on the front part of the parachute lock has started to rub off due to my handling of it, whilst I was trying to connect up the straps. So this has annoyed me that now I have a lock with no wording on it, so I strongly recommend that the front lock is painted with a clear varnish to protect it before handling. 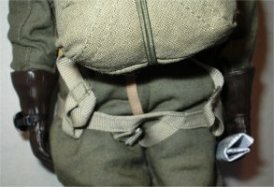 I will try my best to explain how I have assembled the parachute onto the figure, you first need to lay the 'X' part of the straps against the back of the figure, then the parachute pack is then laid on top of this. 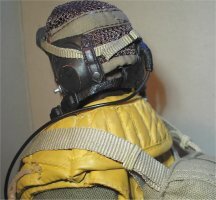 So that the two long straps go over the shoulders, and the 'seat' strap sits on the bottom of the figure as shown below left. 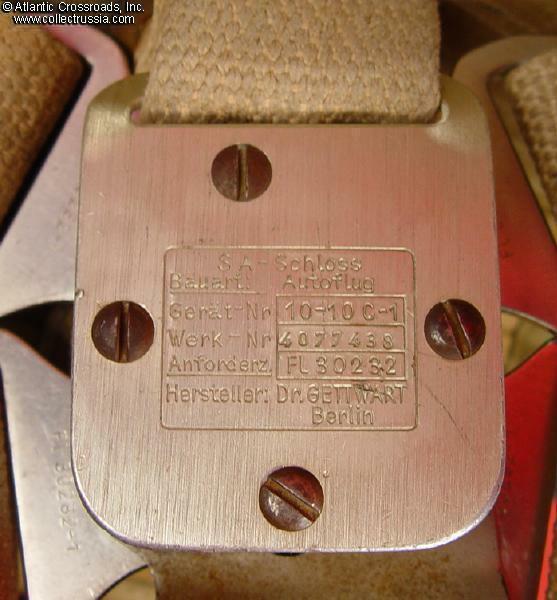 Then the two lowest buckle straps go through the loops as shown below middle, with the buckles facing inwards. 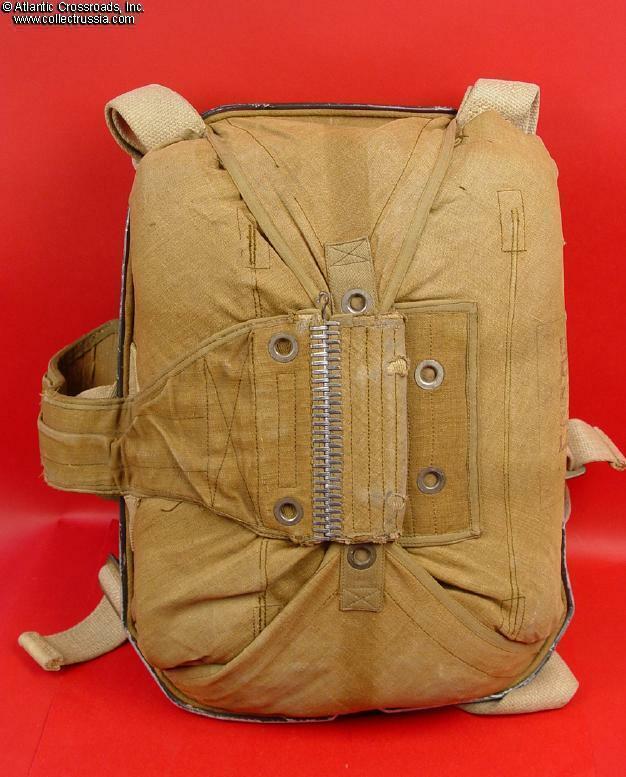 Then the other loop of strap is brought up through the legs of the figure, the buckle straps are fed through that and then folded up so the buckles now face outwards and they are then connected to the main centre parachute lock, as shown below middle and right. 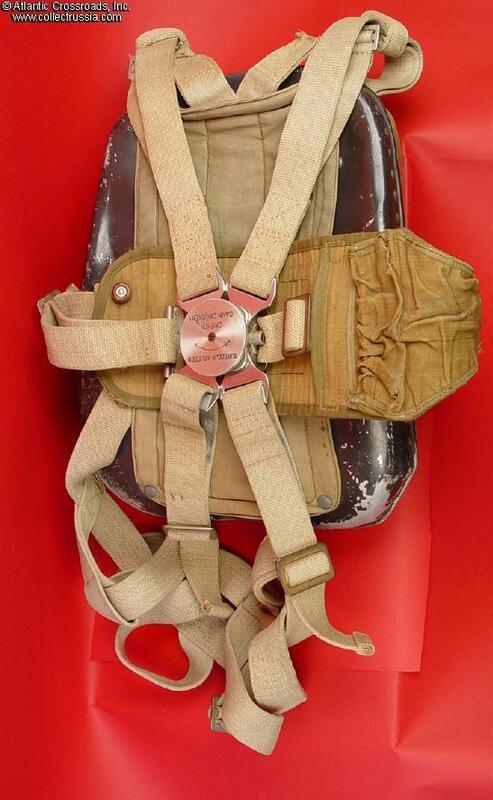 In the pictures below, the left one shows the side of the parachute straps and the seat strap that the are connected to the centre lock brought forward, when they are adjusted to make the parachute sit right. 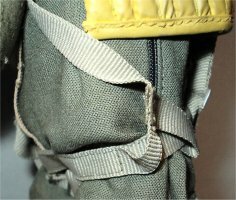 The middle picture shows the lower front straps threaded through the loop between the figure's legs. 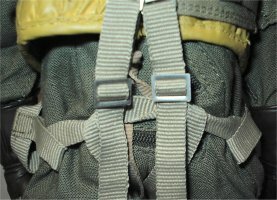 The picture on the right below, shows the top, bottom and side straps connected and adjusted into the centre lock. 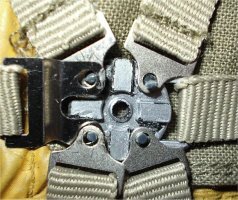 The picture below shows how I have altered the back part of the centre lock again, so that I can get the straps all connected up. 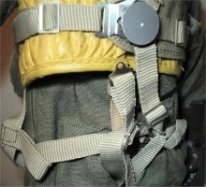 Because unless I am doing something wrong, I cannot see how the tiny pips are supposed to hold both buckle strap connections together on the left hand side. 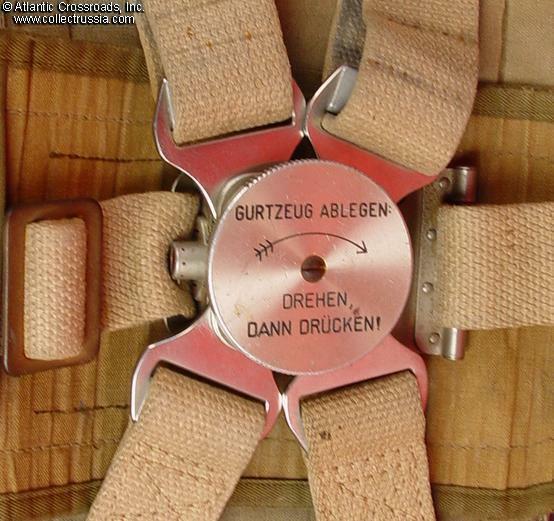 The middle picture below shows all of the straps connected and the now blank centre lock front piece in place. 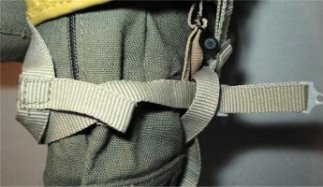 The picture below right shows the other side of the parachute with the release handle. 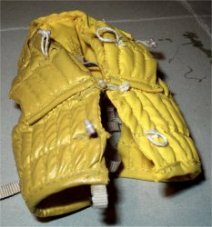 Note: Another problem that has developed is that the outer part of the centre lock is now loose, and it will not stay in place as shown above. So rather than glue it in position, I cut a thin strip of double sided tape and wrapped the metal peg with it, and I then pushed the front part of the lock into position. Chris W for all of his help with pointing me towards the Collect Russia website for the parachute images above. And to Collect Russia for his very kind permission in allowing me to use his images here. 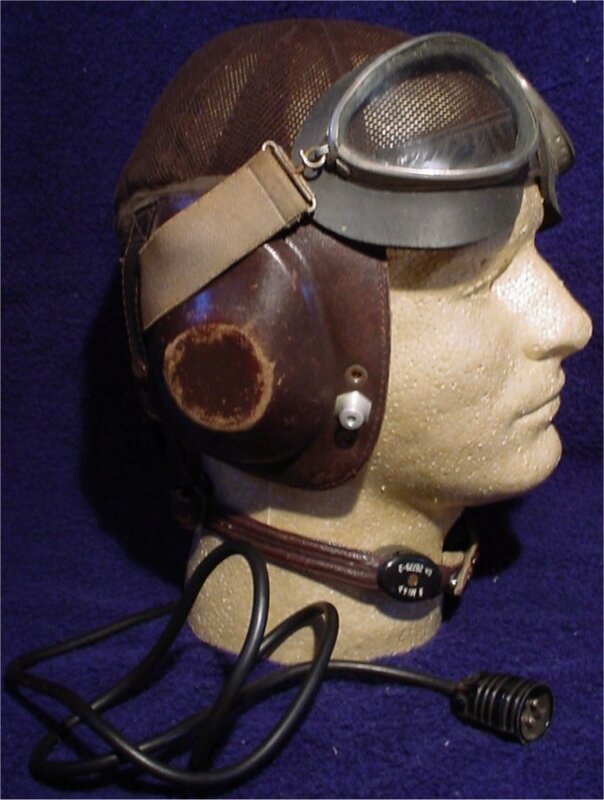 Clint from the C. E. Daniels Collection website, for his very kind permission in allowing me to use the picture of the flying helmet.